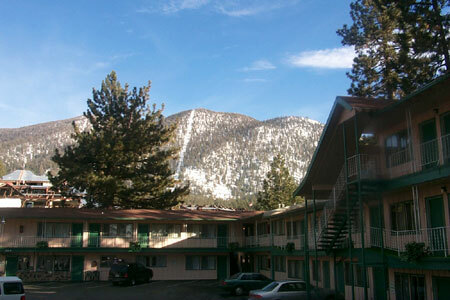 Stateline Economy Inn and Suites is a South Lake Tahoe Motel located across the street from Heavenly Ski Resort's Gondola and the Marriott complex with shopping dining and entertainment. Gambling, golfing, and watersports are all nearby. For winter fun, Squaw Valley Ski Resort, Heavenly Mountain Ski Resort, and Sierra at Tahoe Ski Resort are all close to the Stateline Economy Inn. Call us for great lodging rates in the most convenient South Lake Tahoe location. Just a minute away to the Emerald bay cruises and Tahoe Marina. and central location. Lakeside beach is only mile away. The pet friendly Stateline Economy Inn amenities include a free continental breakfast, free high speed wireless internet access, and parking is always free. All guest rooms feature free high speed wireless internet, hair dryer, microwave, mini-fridge, 40 Inch Flat screen Color Cable TV with HBO, free local calls, iron and board. All pets are welcome at a $20 fee per pet, per night. There is an extra $20 charge per person for each guest after two people in two beds.